After a summer full of dahlia flowers, the first frost of the season will cause some of the leaves on the plant to blacken. This is the time to start the over-wintering process. 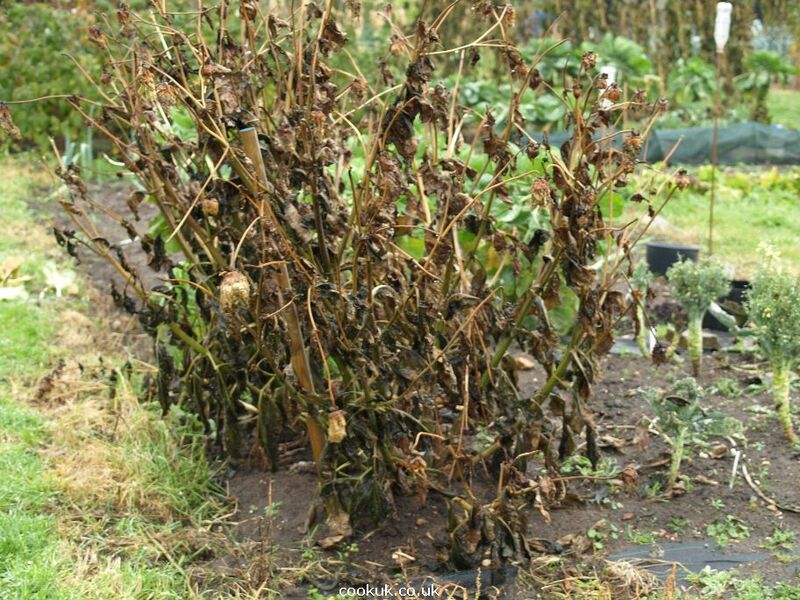 Leave it much later and a severe frost may well damage the dahlia tubers. If the odd dahlia flower is still blooming, cut it and put it in a vase inside as a last memory of the fading summer! The waste can safely be put on the compost heap. Place the fork approximately one foot from the stem stub and insert it deep into the soil at least eight inches. Then gently pry back on the fork to loosen the soil. Repeat this action to totally encircle the stem stub and loosen the soil. At the last insertion, prying back on the fork should lift the stem stub and the clump of dirt. Taking hold of the stem stub, gently lift while prying back on the fork until the clump comes free. Lift gently on the clump with one hand, letting it partially rest on the soil. Using the other hand, carefully remove the soil from the tuber clump. This must be done gently. Many tubers have rather small necks and can be broken or cracked while loosening the soil or carrying the clump to another location. A tuber with a cracked or broken neck will not grow. Having dug up the dahlia tuber, gently hose it down to remove almost all traces of earth. Message: You should have a much better showing next year, Ms. Wright. Tubers that we buy through the mail or in stores are often not handled with care; they are exposed to variances in shipping temperatures, allowed to shrivel, and so on. A winter spent with you treating them correctly will help them greatly. When you replant them in spring, give them a bit more room than you think they need. Crowded dahlias will produce smaller blooms. Tuck some shallow-rooted annuals around them to fill in the space. Also, for the biggest blooms you must sacrifice the number of blooms - pinch off most of the buds so the remaining ones can achieve a larger size. Message: Interesting post! Indeed a very helpful one. Now I can grow these dahlia tubers I got from Lynch Creek Farm.